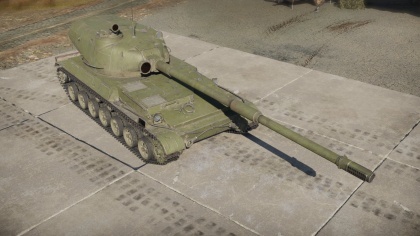 The Object 120 "Taran" is a gift Rank V Soviet tank destroyer with a battle rating of 7.7 (AB/RB/SB). It was introduced late in Update 1.71 "New E.R.A", available on 29 September 2017. Barrel ring around the gun is 100 mm thick. Structural steel boxes on hull sides provide 4 mm of protection. Ammo racks for the Object 120. 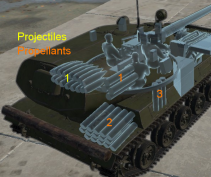 Very high velocity APFSDS round means "point and shoot" at typical War Thunder combat ranges - no need to account for projectile drop at range. Outstanding armour penetration by HEAT-FS and APFSDS rounds. Very good spalling effect from the kinetic energy spread and explosive mass from HEAT-FS round - will usually one-hit-kill. Good mobility for the size of gun. Only Soviet tank destroyer with a turret. Weak armour - vulnerable to anything bigger than a heavy machine gun, and even those from some angles at short range. Poor depression for main armament. 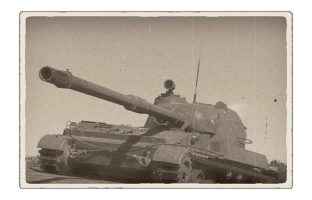 Premium Vehicles - Object 120 "Taran"
This page was last edited on 6 December 2018, at 04:30.